The main suspect in last year's attacks in the Indian city of Mumbai has told a court he is ready to be hanged after admitting his role in the violence. Mohammad Ajmal Amir Qasab's outburst came as prosecutors said he had changed his plea to guilty to secure leniency. Prosecutors want the trial to proceed but the defence says it should end if the court accepts his plea. A decision from the judge is now due on Thursday. More than 170 people were killed in the November attacks, nine of them gunmen. Mr Qasab, who is a Pakistani, faces 86 charges, including waging war on India, murder and possessing explosives. In May, he had pleaded not guilty to all charges. Chief public prosecutor Ujjwal Nikam asked the court to keep Mr Qasab's confessional statement on record and allow them to continue with the evidence and trial. He said the statement was "inconsistent with the prosecution evidence". Mr Nikam said by making the confession, the accused was putting the larger blame on his accomplice [Abu Ismail] who was already dead. "Very shrewdly, very cleverly Qasab has tried to save his own skin by showing he was acting as a subordinate to Abu Ismail," the lawyer said. "He knows that by denying a major role, no Indian court is going to award him the death penalty." At this point Mr Qasab said: "If anyone believes that I am doing this [pleading guilty] to get mercy, then go ahead and hang me." He also told special judge ML Tahiliyani: "Since I have committed the crime in this world, I should be punished in this world. I do not want to be punished by Allah." Defence lawyer Abbas Kazmi told the court: "I'm not prevailing over my client's wishes. If the trial has to continue, then this statement cannot be on record." But, if the court accepts the statement, then it must pronounce the judgement in the case, he said. After hearing both sides, the judge said he would announce his order on how to proceed in the case on Thursday. Earlier, Judge Tahiliyani said the court had taken "all precautions and safeguards before recording" Mr Qasab's statement and he was convinced that the accused understood the implications of his statement. "The accused has been following what is transpiring in the court. He said he wasn't looking for lesser punishment. He said even if the death penalty was awarded, he would not mind. So further clarification is not needed," the judge said. 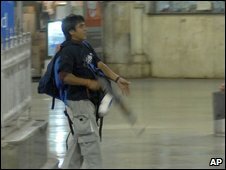 Mohammad Ajmal Amir Qasab, 21, was arrested on the first day of the attacks and has been in Indian custody ever since. He is alleged to be the only one of 10 gunmen to have survived. The others were all killed by Indian security forces. The attacks led to a worsening of relations between India and Pakistan. India accused Pakistan-based fighters from the banned militant group Lashkar-e-Taiba of carrying out the attacks. In the immediate aftermath of the killings, Pakistan denied any responsibility, but later admitted the attacks had been partly planned on its soil. Islamabad also eventually confirmed that Mr Qasab was a Pakistani citizen. That admission, Mr Qasab said on Monday, was what had prompted him to confess. He said his decision to do so had been taken voluntarily. The move took everyone by surprise, most notably his own lawyers. He could face the death penalty if the judge agrees to impose the maximum penalty.